Enjoying these live reports of your cruise, and the great photos. Are you saying that there is a new Pinnacle Menu? And there is no pre dinner music in the Ocean Bar at 5 PM? 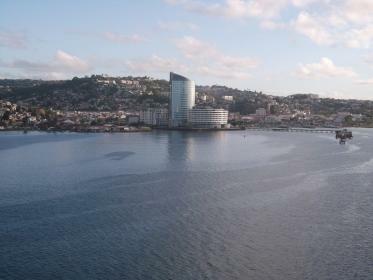 We then made our way to the cruise pier in the harbor (photo attached and at: http://pictures.cruisecritic.com/data/510/Fort-de-France_harbor.JPG ), docking about 8 a.m. We soon were cleared for people to go ashore. 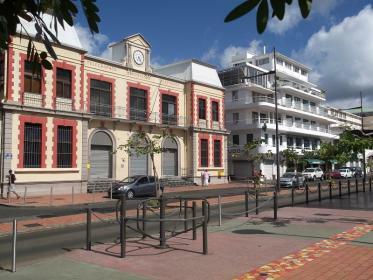 We had been in Martinique in 2010, and had taken the trip that went to St. Pierre, the town destroyed by the volcanic eruption in 1903, so this time looked for something else. There really wasn’t much on offer, but we decided to take the walking tour of the city. We knew it was Sunday and there would not be much open. We then walked into tour for a tour of a couple of hours. I will post this and continue the narrative in another post, since cruise critic only allows a maximum of 5 attachments, and I have 6, so I will split them up. On the walking tour, we went first to the cathederal between Sunday masses. Afterwards, we walked to La Savane park (photo attached and at: http://pictures.cruisecritic.com/data/510/La_Savane_Park_Fort-de-France.JPG ). The park had several kiosks and wide walking avenues, and our guide said it was very popular. 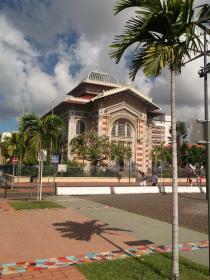 We next visited the library (photo attached, and at: http://pictures.cruisecritic.com/data/510/Fort-de-France_library.JPG ). We then walked to the open-air vegetable market and then a few shopping streets (only a pharmacy, a baker and one or two restaurants were open). By that time, it was 31 degrees Celsius (88 F), so we returned to the ship for lunch. I don't think there have been very many, if any at all, since the menu you posted a while ago. It's just that I like to post the latest when I cruise, just in case there have been changes. There may have been some changes to the wine list. I've transcribed the lunch and dinner menus, and will post them when I finish with the desserts (I can affirm from personal experience that they still have the chocolate volcano cake). I'll try to add the wine list later as well. So far as music in the Ocean bar, it has not been advertised much in the daily explorer, but on the St. Lucia day, there was a foursome playing some dance music (including the lead female singer who did a very creditable cersion of "Fever," which is a tough song to carry off unless you are very good.) We have been mostly in the Crows Nest before early dinner, avoiding the happy hour crush in the Ocean Bar; it's not as bad as you and we experienced on Maasdam, but we try to avoid it in the Ocean Bar. But, we have popped in now and then. I don't think there have been very many, if any at all, since the menu you posted a while ago. As promised above, here are the Pinnacle lunch and dinner menus as served currently on board Noordam. I'll try to add the wine list later. I then did some walkabout, and later enjoyed my sandwich and cold beer and then returned to the ship. DW returned from her snorkel trip and reported it to have been excellent. She was on the ship’s “Carlisle Bay Shipwreck Snorkel” and said they had seen three wrecks and tons of fish, and enjoyed mostly bright sunlight. So, that tour is a keeper. She also reported that she got one of the old blue towels at the gangway, did not have to leave our name/cabin number, and just dropped it in the bin when she returned – in short, Noordam is still using the old way with the towels. A couple of other things I have not mentioned yet, but are still as we remember them: We were in Code Orange for the first 48 hours (successful so far), and they have served hors d’oeuvres in the Ocean Bar before dinner. Tonight was the second formal night. We had reservations at the Pinnacle, and ate way too much of that wonderful food (also as usual). I will post the current menu sometime later in the cruise. Appetizers: Sun-Ripened Pineapple Delight; Orange-Jumbo Shrimp Cocktail; Smoked Duck Carpaccio; Mussels a la Mariniere. Soups and Salad: Ginger Chicken and Vegetable Soup; Country Style Lentil Soup; Gazpacho Andalusia; Boston Bibb Lettuce. Entrees: Tagliatelle alla Conti; Pacific Rim Salad; Crispy Sweet-and-Sour Shrimp; Fillet of Beef Wellington; Sauteed Veal Medallions with Creamy Mushroom Sauce; Pomegranate-Glazed Cornish Game Hen; Savory Grilled Tofu. Desserts: Sorry, I was not able to get the list of desserts for tonight. Vista Lounge: Simply Broadway featuring the Noordam Singers, 8:00 and 10:00 p.m. Ocean Bar: Ben & the HAL Cats, 7:00-10:00 p.m.; Happy Hour 4:00-5:00 p.m.
Crow’s Nest: Solo Guitarist David, 8:00-11:00 p.m.; Happy Hour 9:00-10:00 p.m.
Northern Lights; DJ Jazzy, British Invasion 10:00 p.m-midnight. Tonight’s Movie Taken 2, Queen’s Lounge, 10:00 a.m., noon and 6:00 p.m.
English Afternoon Tea, MDR, 3:00 – 4:00 p.m. Thanks for the great blog and the menu for each night. I had intended to walk into town and go to a place across the bridge from the center of town called, I think, Waterfront Café; it was upstairs with a wrap-around balcony, but I only got as far as about Pelican Village when I remembered that Coconuts, just outside the cruise terminal, also served cutters, and Banks. So I went back and had the meal, that I showed in the photo I posted, at Coconuts. I have not been there personally, but I have read that if you go a bit farther past the town center, you come to the Boathouse and to Lobster Alive, along the beach. Perhaps they also serve cutters. I would be willing to bet that they serve Banks. Well, we just got lazy for the afternoon after I did my earlier blogging. In fact, both of us decided to “watch for flying fish” for a while. After our naps, we dressed for dinner and went to the Ocean Bar and were there for happy hour. There was no dance music, but there were hors d’ouevres again. We met up with Rick (CC name: RAJKR74 ) and his DW Joyce, who has a much better camera than me. She showed me some shots she had taken in Fort-de-France that were much better than mine; they were good enough to publish in magazines. They had joined a lot of the roll call who had decided to take a ferry over to the other side of the bay to a resort for most of the day. Joyce said they had a great time on the beach, and I hope the other CCers did as well. Earlier, we had met up with Lorene, who was very happy again, because her second bag showed up in Barbados! After dinner, we attended a reception hosted by the Captain and the HotMan for senior (3-5 star) Mariners. It was held on the terrace just behind the Oak Room, aft of the Crows Nest on the starboard side on deck 10. We had a pleasant time chatting with fellow passengers, including RevNeal and loekauf. They served champagne and wines, as well as mixed drinks. And, they had the good nuts! Appetizers: Citrus Compote with Honey and Raisins; Seared Ahi Tuna Carpaccio; Crostini with Fresh Tomato, Basil and Prosciutto; Warm Apple Smoked Salmon with Yogurt-Chive Dip. Soups and Salad: Famous Italian Wedding Soup; Red Bell Pepper and Tomato Bisque; Chilled Apple Vichyssoise; Sunset Salad. Entrees: Bucatini with Duck; California Turkey Salad; Grilled Pompano with Olives, Capers and Peppers; Grilled NY Strip Steak with Spicy Pear Salsa; Rum-Glazed Barbeque Pork Ribs; Penang Red Curry Coconut Chicken; Baked Stuffed Eggplant..
Desserts: Flourless Chocolate Cake; Raspberry Terrine; Opera Cake; Raspberry Mousse Torte no sugar added; Vanilla Ice Cream; Rocky Road Ice Cream; Lemon Sorbet; Chocolate Frozen Yogurt; no sugar added Butter Pecan Ice Cream; no sugar added Vanilla Ice Cream; Blackberry Sundae . Vista Lounge: Stand-up comedy from Tom Briscoe, 8:00 and 10:00 p.m.
Queen’s Lounge: Hollywood’s Biggest Night – The 85th Annual Awards Ceremony begins live, 9:30 p.m. Ocean Bar: Lynn & the HAL Cats, 7:00-11:00 p.m.; Happy Hour 4:00-5:00 p.m.
Crow’s Nest: Ben & the HAL Cats, 8:00 p.m. – midnight; Happy Hour 9:00-10:00 p.m.
Northern Lights; DJ Jazzy, Number One Hits, 10:00 p.m-midnight. Tonight’s Movie: Lincoln, Vista Lounge, 1:30 p.m.; Lido Poolside 7:30 & 10:30 p.m.
really enjoying your blog, thanks again for posting - what a stunning photo - you have a good eye for a great shot. That Ocean Bar on Maasdam was a nightmare for Happy Hour. I really don't like the 4 - 5 PM Happy Hour so we never even bothered with it on the Amsterdam. I just glanced over the Pinnacle menus. Will look at them more closely later. But it appears that a couple of the dinner skewers have been eliminated. Well, another day in the Caribbean, another island of natural beauty. 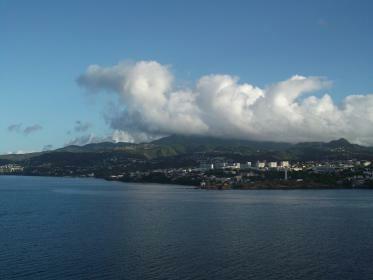 We arrived on time into Roseau as the sun was starting to break over the mountains (photo attached and at: http://pictures.cruisecritic.com/data/510/Roseau_Dominica.JPG . We have been to Dominica twice before, but not for several years. Once we took the Dominica’s Favorites shore excursion, driving through rain forest, and hiking a short hike to a waterfall and beautiful pool at the base. I remember being struck by all of the large wild impatiens plants along the roads. On the other visit, we snorkeled the Champagne reef, called that because bubbles of gas escape from the sea floor and rise to the surface, giving the impression of swimming in a glass of champagne (the impression in my memory was the one fin of the guy in front me made in my forehead, but it was still a very pretty snorkel). This time, we decided to try our luck with the Whale & Dolphin Safari, and go and see if can find any excursion. This turned out to be an excellent tour. We walked to a dive boat a few blocks down the waterfront, and the captained sailed a few miles out due west from the harbor. He the stopped his engines and had his crew put a hydrophone in the water, and fed the sound into the announcing system. He had told us that this was an area where sperm whales congregate at this time of year for mating, and that they had spotted some yesterday. He said to listen for the clicking sounds the sperm whales make when they deep dive hunting for squid. We could indeed hear the clicking. So, the captainfired up his engines and headed in the direction of the sounds. He then again stopped the engines and had the hydrophone lowered. The clicking sounds were much louder and more distinct. He said we now had to wait until they surfaced for 8-10 minutes before deep diving again. A short while later, he spotted one from the bridge, and moved the boat closer for us all to see. After that one dived, showing its tail, we quickly spotted a mother whale with her calf, who surfaced and blowed for a while before diving. Next was one the captain said was a juvenile male who came very close to the boat. In fact, he shallow-dived, and we could see him in the clear sunlit water as he went down by the side of the boat and seemed to look up, seeming to be check us out as we were watching him. He surfaced a few more times, and then he also deep-dived. We saw two more whales before the pod appeared to all have dived again to feed. I learned that these are pretty impressive creatures … and just how hard it is to take their photo from a moving boat bounding in the sea while the whales are also moving! But, I did get a few keepers out of the dozens of snaps I took. I’ve attached two of them; larger size versions at: http://pictures.cruisecritic.com/data/510/sperm_whale_off_Dominica.JPG and http://pictures.cruisecritic.com/data/510/sperm_whale_departing.JPG . We then turned north and went up the coast for a while, looking for dolphins. 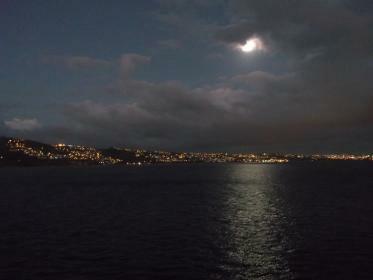 After about a fruitless half-hour, we turned and headed back to port. 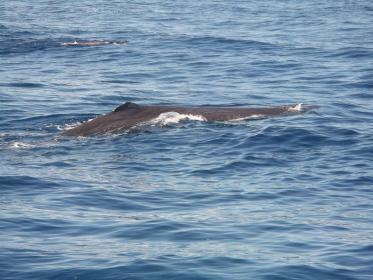 So, we did not see any dolphins on this trip, but that was more than made up for by encountering the whales close-up. The captain said he has about a 95% success rate at this time of year in spotting whales. I don’t know if that was real or just for tourist consumption, but he made our day. All aboard was 2:30 p.m. and sailaway was at 3:00, so we did not go ashore again. Plus, for the first time I remember, the Filipino Crew Show was a matinee today, at 3 p.m. We have seen it on TV a a few times, but never have made it until the usual start time of about 11 or 11:30 p.m. It was a very nice show, and the crew seemed to enjoy putting it on for us. We recognized the librarian and one of the Ocean Bar attendents, Michelle. There were some talented acts, but we were most impressed with the national dance where a young man and woman danced in and out of between two poles while others at each end of the poles rhythmically clanked them together. The dancers did a barefoot dance in and out and kept from getting their ankles bashed, even when the tempo sped up. We’ve seen it on TV before, but it is better in person. I don’t know if this was a one-time thing, or if the show may become a matinee on some cruises. That works better for us early risers, at least. 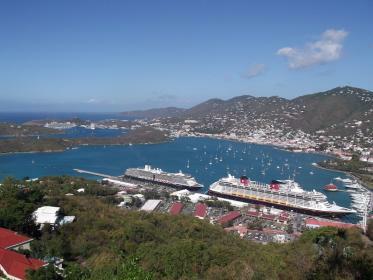 Tomorrow is St. Thomas, and we have no shore excursions planned. We look forward to a lazy, relaxing day. 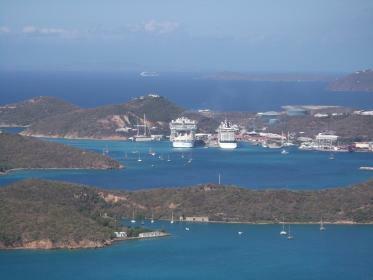 It may be less relaxing around Crown Bay if, as we think, we are sharing it with Allure of the Seas. 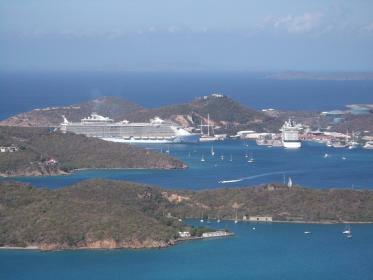 But, last time we were here, we shared Crown Bay with Oasis of the Seas, and it did not seem so bad. We’ll see (and I’ll tell … tomorrow). Appetizers: Caramelized Orange and Grapefruit Salad; Dialogue of Salmon Tartare with Avocado; Golden Tomato and Mozzarella; Crispy Crab Roll. Soups and Salad: Red Bean and Chorizo Soup; Cheddar and Crab Chowder; Chilled Coconut Nutmeg Soup; Bay Oak and Frisee. Entrees: Angel Hair Pasta with Sauteed Vegetables; Grilled Duck Salad and Dried Sour Cherries; Seared Cajun Tuna Steak; Prime Rib of Beef au jus; Calf’s Liver with Apples and Pancetta; Papaya-Stuffed Chicken; “Mousaka Nistisimos”. Desserts: Chocolate Avalanche Cake; Coconut Rice Pudding; Wildberry Charlotte; Cheesecake no sugar added; Vanilla Ice Cream; Chocolate Chip Ice Cream; Strawberry Sorbet; Cookies ‘N’ Cream Frozen Yogurt; no sugar added Mint Chip Ice Cream; no sugar added Vanilla Ice Cream; Bananas Foster Sundae . Vista Lounge: Filipino Crew Show, 3 p.m.; A Dynamic Musical Journey with Paul Pappas, 8:00 and 10:00 p.m.
Crow’s Nest: Solo guitarist David, 8:00 p.m. – 10:00 p.m.; Happy Hour 9:00-10:00 p.m.
Northern Lights; DJ Jazzy, Club 70s – 90s Hits, 10:00 p.m. – 11 p.m.
Tonight’s Movie: Perks of Being a Wallflower, Queen’s Lounge, 12:30 p.m., 2:30 p.m., 5:00 p.m.
Cupcake Tea, MDR, 3:00 – 4:00 p.m.
We've seen the show on TV many times but look forward to an afternoon performance. Loved the pictures of the whales. 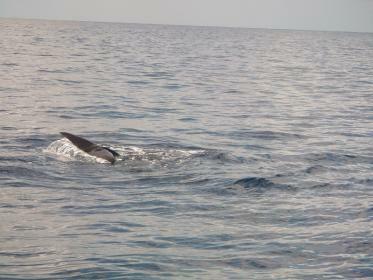 So many people have said that they see whales arriving and leaving Dominica -- we have never seen them. Wonder why your time was shortened in Dominica? We have never left that early. We would much prefer to have the Crew show in the afternoon as well. Wonderful, interesting report and review. Enjoyable reading. 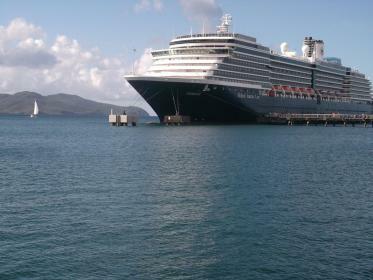 We were on this Noordam cruise in 2011, so have great interest in your port activities. 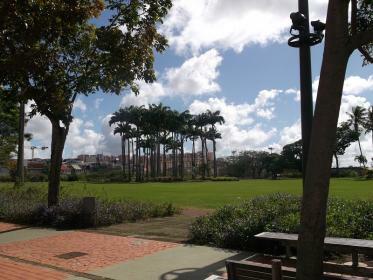 When you went to St Pierre in 2010, did you also go to the Balata Gardens? The gardens were part of our St. Pierre tour in 2011- and quite beautiful. 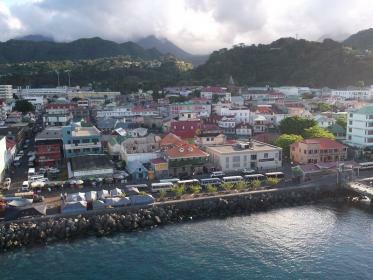 Also, what do you think of Martinique as a port stop? Would you want to stop there again? Well, it appears I was wrong on a few counts. It seems Oasis of the Seas did indeed pull into Crown Bay. But, we didn’t. 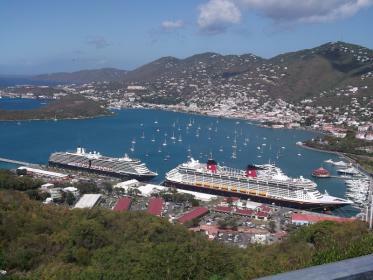 Instead, we pulled behind Disney Fantasy at Havensight. Later in the morning, Carnival Dream pulled in behind us. The other ship at Crown Bay was Celebrity Eclipse. A fellow passenger said he had heard there would be six ships in St. Thomas today, but I did not see the other one arrive; it may be anchored out and tendering. We went ashore about 9 a.m. and decided that, since we were at Havensight, we would take the skyway to Paradise Point. The ride was a few minutes’ walk away, at the end of the Havensight shopping area. After we bought our tickets, we walked many steps up to board the gondolas. At the top, we went to the terrace bar. This also involved many steps, so I’m not sure it would be a good trip for mobility-challenged people. The nature trail was closed for repairs, and we noticed that there was some construction work going on to the main building. The shops were open, as was the terrace bar/restaurant and downstairs restaurant. Yes, we did go to the gardens as part of the church and St. Pierre tour in 2010. And, while Martinique may not be our favorite stop in the Caribbean, it's OK. They offered a snorkel trip we might try if we come back, and our fellow passengers said they had a good time at the beach across the bay.